Hebrew Roots | What is it? Elijah truly shall first come, and restore all things. The book of Matthew describes a mountaintop vision where Yeshua's leading disciples - Peter, James, and John - saw the glorified Messiah and what apppeared to be the prophets Moses, and Elijah standing next to Him. Recognizing the vision as being indicative of the Messianic Kingdom, they asked Yeshua why the scibes say that Elijah would come before the Kingdom is restored. Yeshua's answer was that the scribes were correct! Elijah the Prophet . 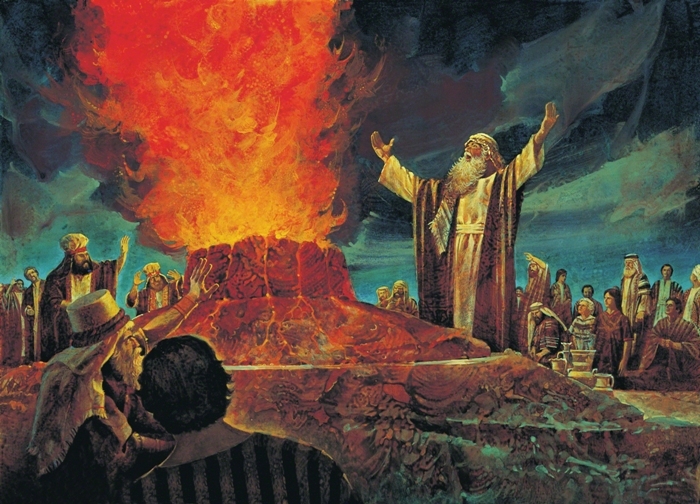 . .
Elijah is the Bible's picture of restoration. After the kingdom of Israel was divided into the two nations of Israel and Judah, Elijah was sent to the northern kingdom of Israel to restore the people back to the ways of the God of Israel. In the book of Malachi, it is Elijah who is to 'return the hearts of the fathers to the children and return the hearts of the children to the fathers (Malachi 4:6). Though this passage is often understood in a familial way, the Hebrew behind the text indicates that a 'returning' or 'restoration' will be taking place. The hearts of God's people will return to the fathers - Abraham, Isaac, and Jacob, and the hearts of those beacons of faith will be restored in the people. But Abraham's heart was about more than faith, his 'heart' was one of obediance . . . obediance to God's Torah. Abraham the Hebrew . . .
Abraham walked in the way of God. He was not a Jew, nor was he a Christian. He was a Hebrew. The term " Hebrew " is rooted in the concept of crossing over. Abraham forsook the polytheistic ways of his father and crossed over the Jordan River into a new life - a life of trust in God and faithfulness to His ways. As a result, he was blessed and became a picture of God, even to the point of having a son that was concieved at an age that would normally be considered 'impossible'. Before that son was born, God said about Abraham - ". . . For I know him, that he will command his children and his household after him, and they shall keep the way of the LORD, to do justice and judgment; that the LORD may bring upon Abraham that which he hath spoken of him." (KJV Genesis 18:19) "
Scripture shows that Abraham's inheritance was passed on because he "... obeyed my voice, and kept my charge, my commandments, my statutes, and my laws (NKJ Genesis 26:5). the Hebrew Roots Awakening . . .
Hebrew Roots is an "awakening" - an awakening to the walk of faith God gave the Hebrew people. It is an attempt to pattern one's life after the examples of righteousness God gave us . . . men like the 'fathers' - Abraham, Isaac, and Israel, and of course - the 'Hebrew of Hebrews', Messiah Yeshua. We believe we are a part of the restoration of all things that must take place before the end of the age and the restoration of the Kingdom of God on Earth.